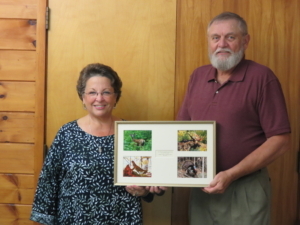 At the annual meeting of the Wildlife Heritage Foundation of NH on September 20, 2017, Steven White, who has served the Foundation during the past seven years as Chairman of the Board of Directors, passed the gavel to Deborah Coffin, who was unanimously elected the new chairman of the Foundation. Steve White’s tenure saw a major growth in the Foundation, and his deep commitment to the Foundation and to NH Fish and Game has resulted in the funding of over 80 grants to NH Fish and Game for under-funded or unfunded projects from fundraising as well as private and corporate donations. Mr. White’s primary passion has always been to preserve NH’s treasures for future generations, and teach young people the joys of being in the outdoors, and the stewardship they need to embrace to preserve and protect the many opportunities available in NH’s outdoors. Deborah Coffin has been a member of the Foundation’s Board of Directors since 2014, and has led the Development/Marketing Committee, and also served as Vice-Chairman of the Board. She thanked Mr. White for his extraordinary leadership, and looks forwarding to working collaboratively with NH Fish and Game, and also exploring new partnerships to seek private funding to enable the Foundation to continue to support NH Fish and Game as they work to guard the state’s fish, wildlife and marine resources. Ms. Coffin has extensive non-profit board experience, and was a founding member of “Forever Locked”. Forever Locked, with a mission to create an educational wildlife exhibit of a naturally occurring wildlife phenomenon, is a life-size, museum-quality taxidermy exhibit depicting a rare dueling event of two bull moose with permanently locked antlers. Mr. White was presented with several commemorative gifts, and will remain on the board’s Finance Committee, as well as lending his experience as Chairman Emeritus. Thank you Steve White, and congratulations Deborah Coffin!